Our communities deserve the best from their media in these deceitful times. University media are among the few that can still be trusted and they should do their best to contribute to democracy with integrity. France and the Ecole Supérieure de Journalisme de Lille (ESJ) played a critically important role in helping establish the journalism degree programme at the University of the South Pacific in 1994, with the French government funding the inaugural senior lecturer, François Turmel, and providing a substantial media resources grant to lay the foundations. I arrived in Fiji four years later in 1998 as Head of Journalism from Papua New Guinea – along with Ingrid Leary – and what a pleasure it was working with the French Embassy on a number of journalism projects at that time, including an annual scholarship to France for journalism excellence. These USP awards this year take place during challenging times for the media industry with fundamental questions confronting us as journalism educators about what careers we are actually educating journalists for. When I embarked on a journalism career in the 1960s, the future was clear-cut and one tended to specialise in print, radio or television. I had a fairly heady early career being the editor at the age of 24 of an Australian national weekly newspaper, the Sunday Observer, owned by an idealistic billionaire, and we were campaigning against the Vietnam War. Our chief foreign correspondent then was a famous journalist, Wilfred Burchett, who at the end of the Second World War 70 years ago reported on the Hiroshima nuclear bombing as a “warning to the world”. By 1970, I was chief subeditor of the Rand Daily Mail in South Africa, the best newspaper I ever worked on and where I learned much about human rights and social justice, which has shaped my journalism and education values ever since. I travelled overland for a year across Africa as a freelance journalist, working for agencies such as Gemini, and crossed the Sahara Desert in a Kombi van. It was critically risky even then, but doubly dangerous today. Eventually I ended up with Agence France-Presse as an editor in Paris and worked there for several years. In fact, it was while working with AFP in Europe that I took a “back door” interest in the Pacific and that’s where my career took another trajectory when I joined the Auckland Star and became foreign news editor. The point of me giving you some brief moments of my career in a nutshell is to stress how portable journalism was as a career in my time. But now it is a huge challenge for you young graduates going out into the marketplace. You don’t even know whether you’re going to be called a “journalist”, or a “content provider” or a “curator” of news – or something beyond being a “news aggregator” – such is the pace of change with the digital revolution. And the loss of jobs in the media industry continues at a relentless pace. Fiji Media Industry Development Authority chairman Ashwin Raj during the 2014 general election. Fortunately, in Fiji, the global industry rationalisations and pressures haven’t quite hit home locally yet. However, on the other hand you have very real immediate concerns with the Media Industry Development Decree and the “chilling’ impact that it has on the media regardless of the glossy mirage the government spin doctors like to put on it. “I have previously tried to do stories in Denmark and New Zealand – two countries that are both in the top 10 on the RSF World Press Freedom Index, so I was a bit nervous before travelling to a country that is number 93 and doing stories there …. “Fiji proved just as big a challenge as I had expected. The first day I reported for duty … I tried to pitch a lot of my story ideas, but almost all of them got shut down with the explanation that it was impossible to get a comment from the government on the issue. “And therefore the story was never going to be able to get published. This was a nice piece of storytelling on climate change on an issue that barely got covered in New Zealand legacy media. One of the ironies of the digital revolution is that there is an illusion of growing freedom of expression and information in the world, when in fact the reverse is true. These are bleak times with growing numbers of journalists being murdered with impunity, from the Philippines to Somalia and Syria. The world’s worst mass killing of journalists was the so-called Maguindanao, or Ampatuan massacre (named after the town whose dynastic family ordered the killings), when 32 journalists were brutally murdered in the Philippines in November 2009. But increasingly savage slayings of media workers in the name of terrorism are becoming the norm, such as the outrageous attack on Charlie Hebdo cartoonists in Paris in January. Two masked gunmen assassinated 12 media workers – including five of France’s most talented cartoonists – at the satirical magazine and a responding policeman. In early August this year, five masked jihadists armed with machetes entered the Dhaka home of a secularist blogger in Bangladesh and hacked off his head and hands while his wife was forced into a nearby room. While there appear to be far more democracies in the world than ever before, the CPJ’s executive director Joel Simon says there is a sinister new threat. Simon points out that democratators win elections yet while they may be free, they are not really fair, meaning they are decided by fraud. He has a growing list of leaders that fit this label, including Latin American “populists” like Rafael Correa of Equador and Daniel Ortega of Nicaragua, “European backsliders” like Viktor Orban of Hungary and Viktor Yanukovych, the deposed former president of Ukraine, and African leaders such as Paul Kagame of Rwanda and Jacob Zuma of South Africa. Also high on Simon’s list of media threats is the way terrorism has impacted on how big media groups currently go about their global news-gathering. Conscious of the ever-present threat of ritualised kidnappings and bombings, journalists are sometimes forced to report from bunkers and are less enthusiastic about meeting uncertain sources in case they might be abducted. 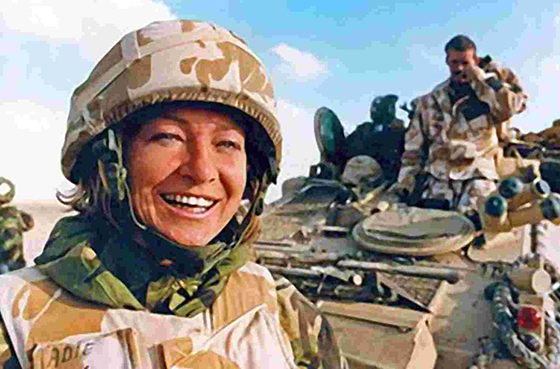 Even the appearance of journalists sometimes makes them look like an extension of the military – with helmets, flak jackets and camouflage fatigues. This accentuates their targeting by fundamentalist groups who regard them as an extension of the “state”. China is the elephant in the room when it comes to freedom of information. While China’s leaders embrace the internet, they believe they can, and ought to, control the web. It is clear that China has the technological means and resources to make internet control a reality. Chinese authorities use monitoring and filtering to keep a lid on the cyberspace “conversation” to prevent repercussions. United States responses to the Wikileaks scandal in 2013 and the massive surveillance revelations by Edward Snowden encouraged allegations of hypocrisy from critics pointing out that Washington’s commitment to internet freedom dragged when its own geopolitical interests appeared threatened. Earlier in October, I had the good fortune to be in Brussels as one of the people giving feedback at a stakeholders meeting for a massive European Union-funded research project on the media reporting on six major violent conflicts around the world, including the Syrian civil war and conflict in Burundi. Who was he? says the subeditor in me when it was always drummed into us to have a name in the headline. (The online version changed the headline). This was the story of Pedro J. Ramírez, one of the leading editors in Spain, who had been in charge of El Mundo for 24 years. But he was sacked by his newspaper’s owners. Why? Because under his leadership, El Mundo pursued a robust investigation into corruption implicating the governing Popular Party and the Prime Minister [Mariano Rajoy]. When he was fired, Ramírez used his massive €5.6 million pay-out to help fund a new online newspaper, El Español. His pay-out plus record-breaking crowdfunding doubled what had been previously raised by a new Dutch publishing venture, De Correspondent. Another interesting success story has been in France, where investigative journalist Edwy Plenel, famous for his Rainbow Warrior bombing investigation in 1985 for Le Monde, founded Mediapart. 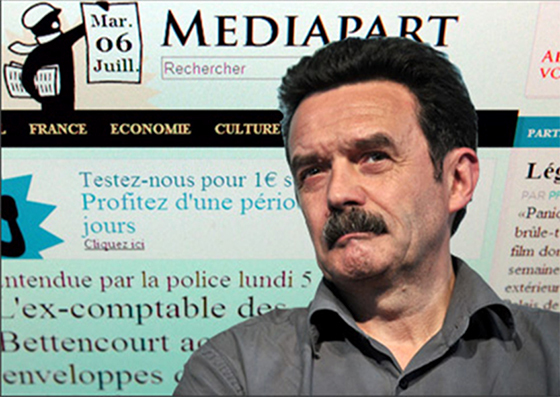 French investigative journalist Edwy Plenel and his Mediapart website. He has assembled a team of some 60 journalists and his fearless brand of investigative journalism is shaking up the establishment. Even in New Zealand, where the mediascape is fairly dire with hundreds of jobs cut in recent years—and a loss of 180 jobs in a recent shake-up at Fairfax New Zealand, the country’s biggest news publisher, there are stunningly innovative things happening. The main independent New Zealand media group Scoop Media – and we at AUT’s Pacific Media Centre have a partnership project with them, Pacific Scoop – has launched a new crowdfunding business model and established a Scoop Foundation for Public Interest Journalism.The inititiative by Selwyn Manning in launching Evening Report web portal has also been significant. This brings me to the achievements of the University of the South Pacific and its talented new crop of graduates. 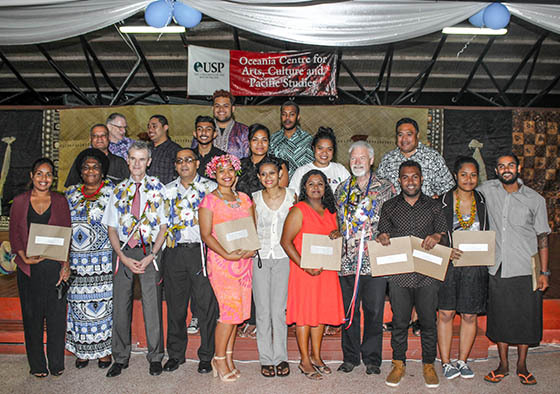 Close to 200 USP journalism graduates are now contributing to the Fiji and the Pacific region’s media and related careers. Through its long-standing award-winning newspaper Wansolwara – now 19 years old, surely a remarkable accomplishment for any journalism school in the Australasian and Pacific arena, the student journalists have played an important role in independent, engaging and truth-seeking journalism. Personally, I shall always remember with pride my experiences with USP and Wansolwara over the five years I was with the campus – the longest by far of any expatriate educator. Wansolwara was founded by student editor Stan Simpson and lecturer Philip Cass. And Pat Craddock of the USP Media Centre was another key person in building up the programme. article about the USP students. 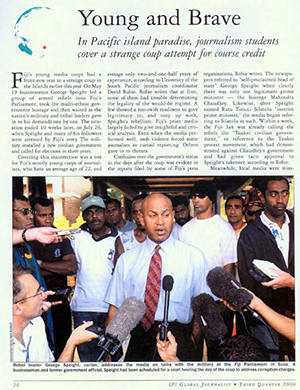 One of the highlights for me was the reporting of the George Speight coup in May 2000 by the courageous USP students. They won many awards for this. It was thanks to the groundwork and experience that I gained at both USP and previously UPNG as a journalist turned academic that I was able to go to the next level at the Pacific Media Centre. There I have been able to blend some of the best elements of academic media studies and practical journalism that makes a difference. A tribute too to Dr Shailendra Singh and his team, Irene Manarae, Eliki Drugunalevu and Dr Olivier Jutel. Shailen was recently the first home-grown academic at USP to gain a PhD in journalism at the University of Queensland with the first major survey of the Fiji mediascape for more than a decade. Congratulations Shailen for a very fine thesis! My concluding message to graduating student journalists is that no matter what government, political or industry pressure you face, you should hold on strongly to your core values of truth, accuracy, honesty and courage in the public interest. So go for it and change the world to the way it should be! Dr David Robie is Professor of Journalism and the Director of the Pacific Media Centre in Auckland University of Technology’s School of Communication Studies. He was head of journalism at the University of the South Pacific between 1998 and 2002. 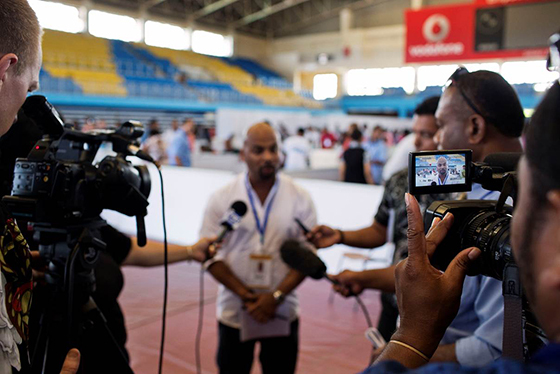 This was his address at the awards in Suva, Fiji, on October 30 celebrating 21 years of the USP journalism programme. Thanks for sharing. Please allow me to add share something as well. Have you heard about Binfer? It is a secure way to share digital media.